Sree Kurumba Bhagavathy Temple, popularly known as Kodungalloor Bhagavathy Temple, is one of the oldest temples in the State. The temple is famous for the annual Bharani festival usually falls in the Malayalam month of Meenam (March-April) every year. What makes this festival unique is that, during Bharani festival, a sea of red overruns the premises as a flurry of oracles dancing in a trance offer their prayers to the deity. 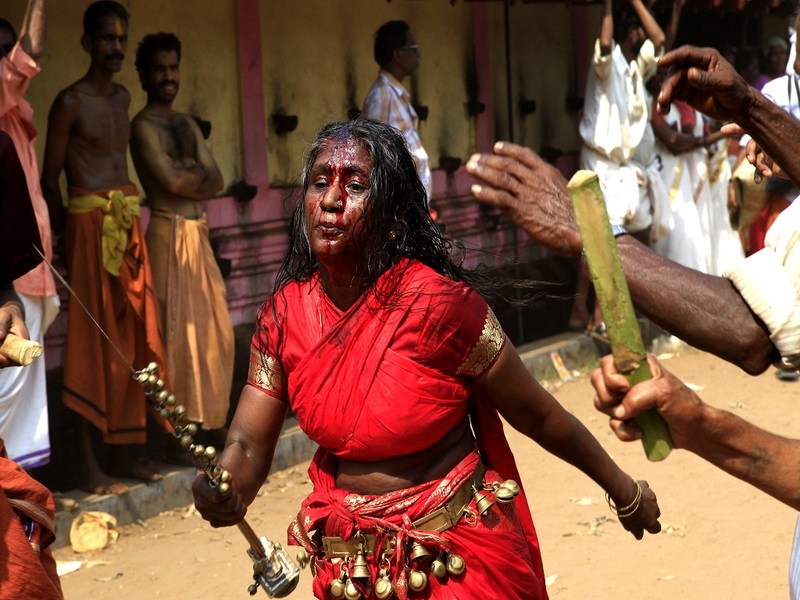 It is the largest congregation of Velichappadu or Komarams (oracles), both men and women. The legendary Bharani festival is noted for the spectacular event called kaavu theendal in which Komarams; both men and women from different parts of the State arrive at Kodungalloor Bhagavathy temple and is the day prior to Bharani asterism. The oracles run in a trance around the temple and smite their crown with sword, proclaiming their communion with the Mother Goddess. Meanwhile, the devotees strike the temple rafters with sticks and hurl offerings over the roof and on to the inner quadrangle. Another ritual held during the festival is Chandanapodi Chartal. Every year, pilgrims and curious visitors come to attend this seven-day annual festival at the Kodungalloor Bhagavathy Temple. Following the festival, the temple would remain closed for a week. It is believed that the temple was built by a Chera king to Kannaki, the heroine of Ilamkovadigal's Tamil classic Chilappathikaram. Another festival celebrated here is the Thalapoli festival, held in the Malayalam month of Makara (January-February).